Today is already Eid ul-Fitr in Indonesia. 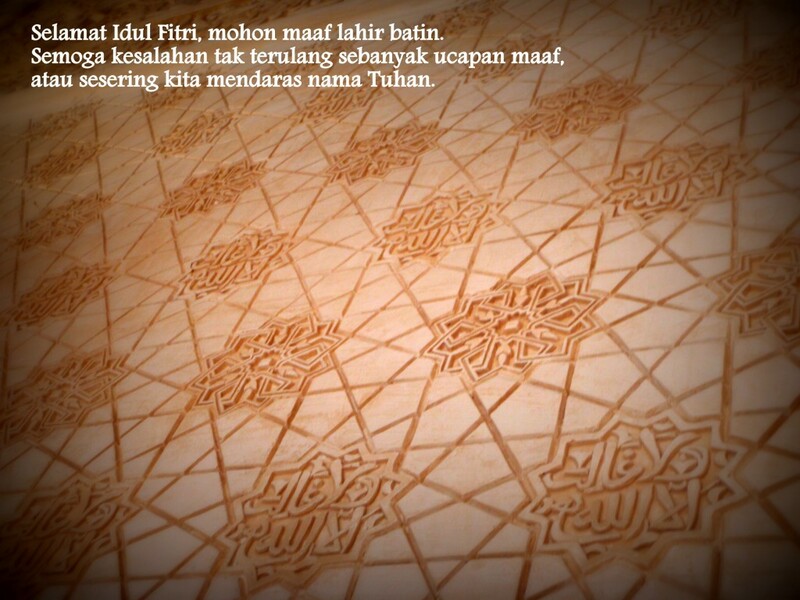 Indonesians render the Arabic phrase as Idul Fitri, or even more often, Lebaran. The origin of the word Lebaran is debatable — some said it is rooted in the Javanese “wis bar” (finished), signing the end of the fasting month Ramadan, another might argue that it is from the Indonesian word “lebar” (wide, broad, vast, or spacious), meaning the ample room in our heart to forgive others and rejoice the festivity. Idul Fitri will come in The Hague tomorrow. It will be the first time for me to have Lebaran abroad, without family and the usual rituals. Although I’m lucky to have some friends here who celebrate it, too. Traditionally, it is the day when we gather with extended family, after a year living separately. It may equal Christmas for Christians of Thanksgiving for the Americans. In the morning, we go to Eid prayer. Then we gather with the big family. When I say big, it’s big. My dad is the seventh of ten siblings, while my mom is the third of eleven. With cousins, nieces, and nephews, a gathering in each extended family from my mom and my dad’s side will consist at least 40 people. Things will differ in the next generations to come, though, as none of my cousins have children that much anymore hahaha. We ask forgiveness, we forgive. We engage in conversations, we catch up what’s happened in the past year, we laugh, we… EAT. Oh God. Don’t we eat so much good food! Every tribe and region has its own special dishes, but the typical dishes are ketupat (steamed rice packed in coconut leaves), opor ayam (light chicken curry), and sambal goreng ati (spicy beef liver). An addition in my dad’s Minang household will be rendang (spicy beef stew), dendeng balado (spicy dried beef), and lamang tapai (sticky rice with fermented black rice). Damn I miss this part of Idul Fitri! Anyway, we also ask forgiveness from friends and whomever we interact with. Sometimes it only becomes a habit which loses its essence. I hope I’m not doing it to you, who I interact with through this blog. Because I know I’ve made some mistakes, I’ve hurt some people, I’ve done things I’m not proud of. I apology for any wrongdoings in the past. The words in the picture above, roughly translated into English, means “Happy Idul Fitri, please forgive me for any mistakes. I hope we won’t repeat our mistakes as often as we ask for forgiveness or pronouncing God’s name.” The photo was taken in Alhambra and the font is, just to match the location, is Andalus.